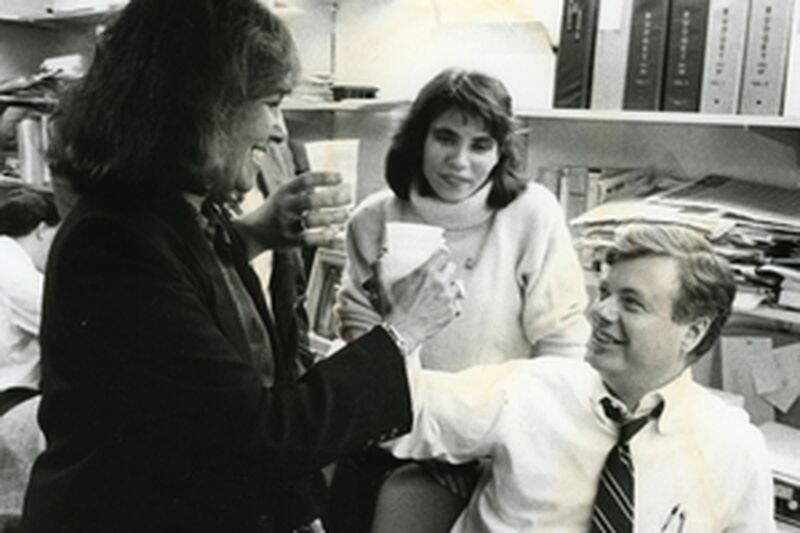 Fumo shares a toast in 1988 with friend Jean Bender (left) as Jane Scaccetti looks on. Fumo and Scaccetti later married and then split up. Ed Rendell, while preparing to run for governor in 2001, built a summer home in Ocean City. A private investigator, hired with tax dollars by state Sen. Vince Fumo, was watching. Fumo, supporting then-state Auditor General Bob Casey Jr. in the Democratic gubernatorial primary, told the private investigator to find out how Rendell could afford the house and if union laborers were being used on the job. When the investigator offered to send his findings to Casey's campaign, Fumo replied by e-mail, "I will handle it." That was one of several revelations in yesterday's 267-page indictment charging Fumo with 139 counts for using state money for personal and political uses. The indictment also alleges Fumo used the private eye to spy on his ex-wife and ex-girlfriends. Fumo had the Senate Appropriations Committee, which he headed until stepping down Monday, pay the private investigator $205,187 from 2001 to 2005 for "information analysis and consultation," according to the indictment. A subsidiary of Citizens Alliance for Better Neighborhoods, a nonprofit organization founded in 1991 by Fumo staffers, also paid the private investigator $3,250 in 2002 for "political surveillance." The subsidiary listed that expense on tax forms as "community development consulting." The private investigator, Frank Wallace, is a retired Philadelphia police inspector who once headed the organized-crime unit. His attorney, Frank DeSimone, declined to comment yesterday. Rendell's spokeswoman, Kate Philips, also declined to comment. Larry Smar, a spokesman for Casey, now a U.S. senator, issued a statement praising Fumo but did not respond when asked if Casey had known about the spying. Fumo also used Wallace to spy on electricians union chief John Dougherty at the height of their political feud, according to the indictment. Wallace hired another investigator to sit outside a bar in a building partly owned by Dougherty to videotape people who attended a political meeting there. A copy of that two-hour tape was sent to Fumo's Senate office and then mailed to him at his vacation home in Florida. The second investigator also researched construction permits on a Wildwood home that Fumo suspected Dougherty owned. Dougherty in a statement yesterday said he had no idea why Fumo might have ordered a private investigator to spy on him. "It's extremely troubling to think that he may have violated my civil rights and invaded my family's privacy to such an outrageous degree," he added. _ Spying on Fumo's ex-wife to learn whom she was dating. _ Spying on a former girlfriend after they broke up in 2002, with instructions to call police if she appeared to be driving while drunk. _ Trying to get that ex-girlfriend's new boyfriend's driver's license revoked. _ Seeking private medical information on a relative.